Conrad Tao, composer, opens at Bruckner program at the New York Philharmonic. Conrad Tao’s world premier composition Everything Must Go was performed by the New York Philharmonic and followed without a breath by Anton Bruckner’s powerful Eighth Symphony. Tao talks about listening to the world about him. It is no longer a world of bird calls and tree leaves whispering in the wind. At one moment you hear an Edgard Varèse-like traffic screech. Yet it is the percussion the brings us into an urban sound scape, slapsticks, temple blocks, brake rims, tom-toms and a kick drum create new sounds that startle the ear. Tao imagines the cathedral, magnificent in harps, xylophone and marimba and the melting away to make way for a new space. It feels holy. The suggestion of a Claude Debussy phrase from Submerged Cathedral floats subtly by. Tao creates an unsettling darkness which so perfectly set off the first movement of Bruckner’s symphony that many of the audience started. Whose music were they hearing? Tao loved being the send up for Bruckner and disturbing the audience. Unstable tremolos are the least of the Bruckner. The Philharmonic, under Jaap van Zweden, gave a thrilling performance of the Eighth Symphony. The ”churning, insistently slow pace of the symphony” had inspired Tao too. In the hand of the orchestra’s brass and woodwinds, the lovely repeated melodies soared. The demands on the strings may be exhausting, yet surely they were 'giving up' all their energy to the Bruckner. Terrifying dissonance disturbs. Chromatic fragments celebrate beauty. Trumpets blast out funereal tones. Basses sigh. It is of a wonderful sound and space world for both composers. Duplicating the sound of his instrument of choice, the organ, in a swelling orchestra, Bruckner too hears the indeterminate sounds of our time. 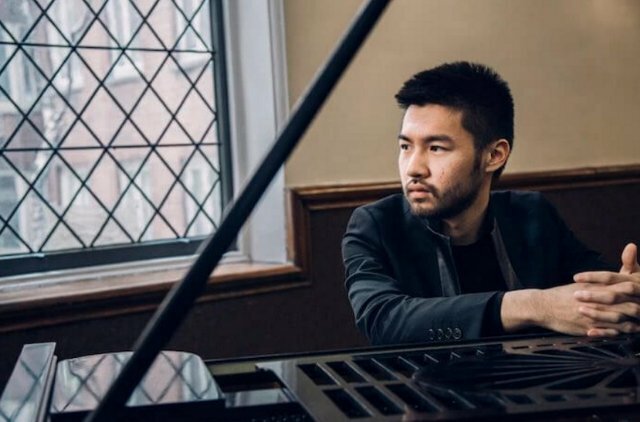 Big, conventional classical music organizations now need Tao and other young talents whose nips at their heels have barely registered until very recently. This is not true of the new Philharmonic music director, who identified Tao early as a brilliant pianist and violinist, and also a budding composer. Slowly step-by-step, Charmaine Lee at Roulette and Caleb Teicher at Baruch have stepped into the limelight, as Tao has, on his own terms.